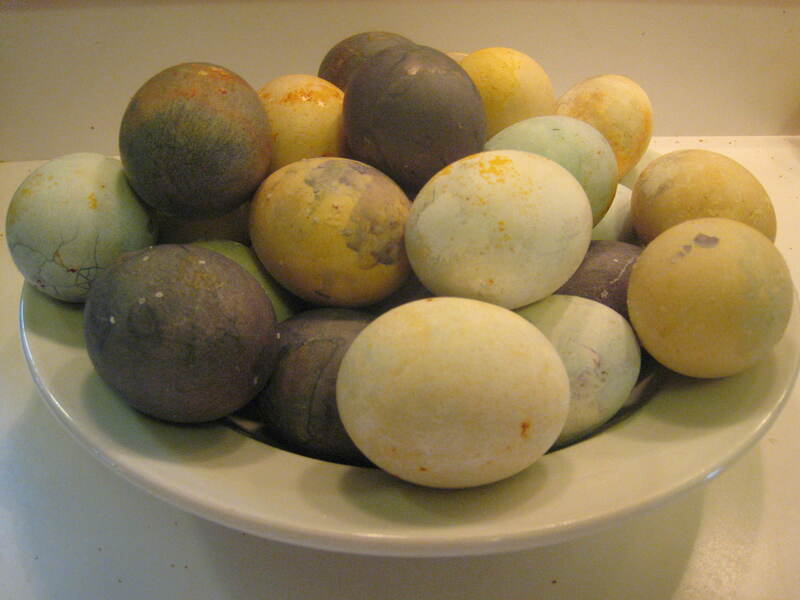 I’ve always wanted to try making natural egg dye, and when I saw the how-to article by Lee Svitak Dean in the Minneapolis Star-Tribune, I decided to give it a go. 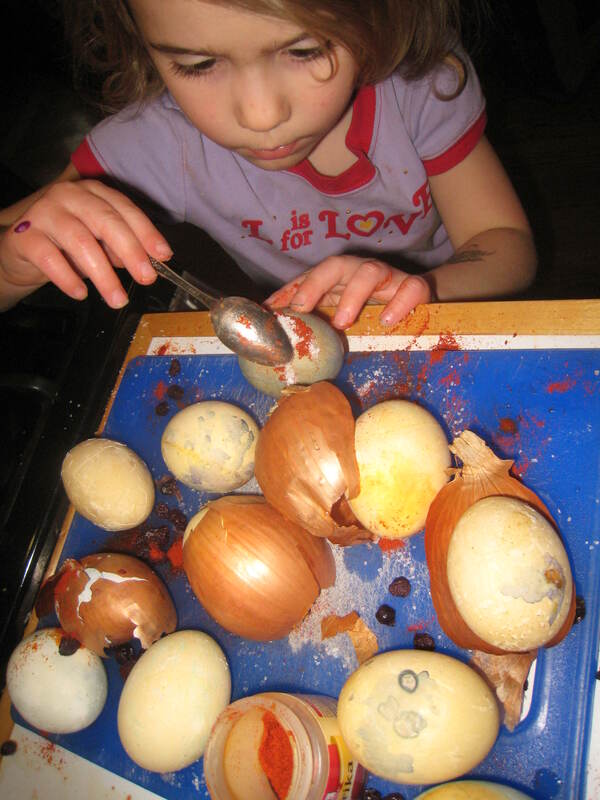 The dying part involves boiling, so is best done by a parent, but your child will have fun wrapping the dyed eggs in onion skins and rubbing them with colorful spices! 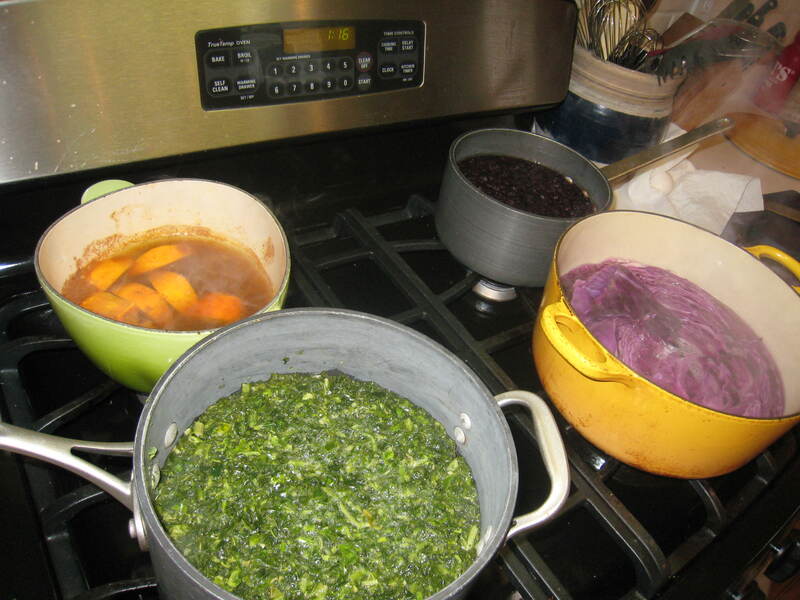 I cleaned out my freezer and found frostbitten blueberries and chopped spinach to use for two of my dyes. A head of red cabbage and bottle of curry worked for the other two. Boil colorful fruit, vegetables and spices with 4-8 cups water and a few Tbs. of white vinegar. When the water is boiling, add raw eggs and boil for 10 minutes. 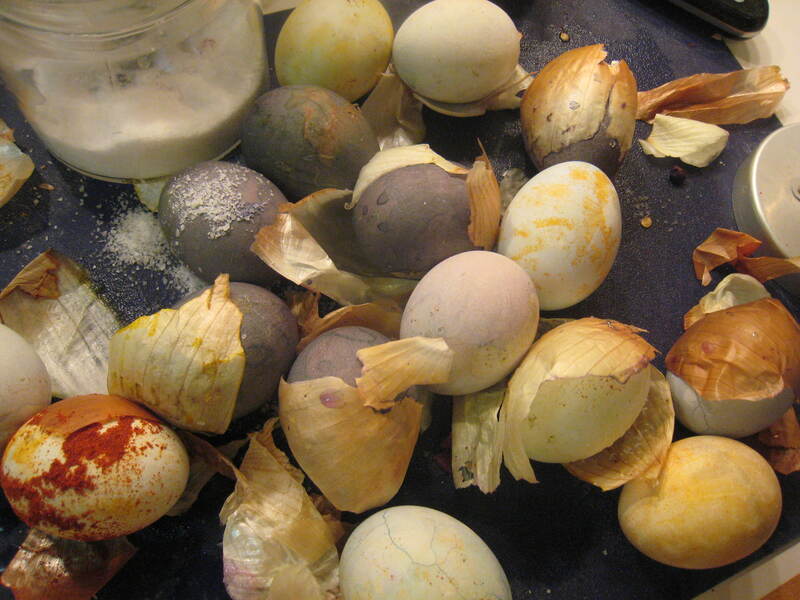 The pigment in the fruits and veggies will be absorbed by the egg’s porous surface as they cook. Let sit until cool. You can chill them in the dye over night for more intense color. Then, wrap the wet eggs in onion skins or rub with paprika for yellow. We also smeared blueberries and sprinkled sea salt on our eggs. Experiment with different dyes! We had the best luck with blueberries, curry and red cabbage. Spinach didn’t work so well. What worked best for you? Don’t forget to eat your creations. Hard-boiled eggs make a great snack! 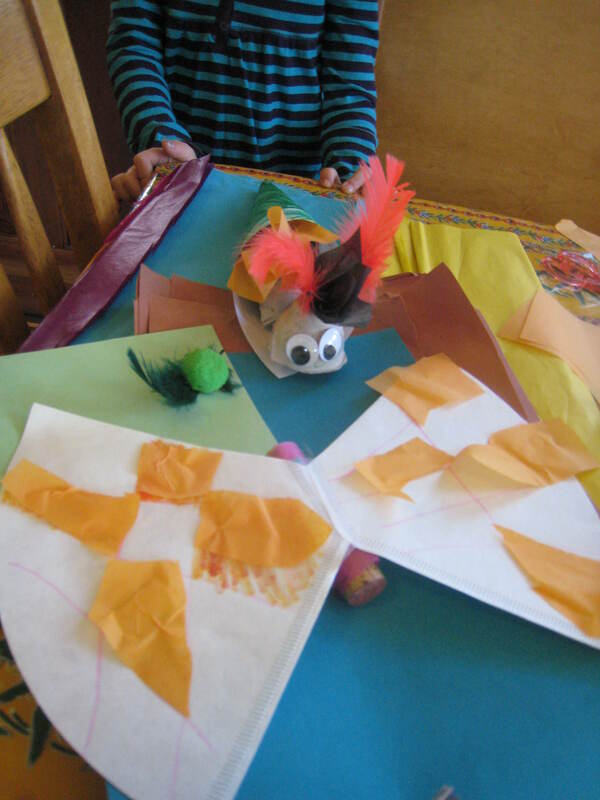 Using construction paper, egg cartons, coffee filters, and your recycled “junk” bin or craft bin, your child can take a butterfly all the way from egg to wings. 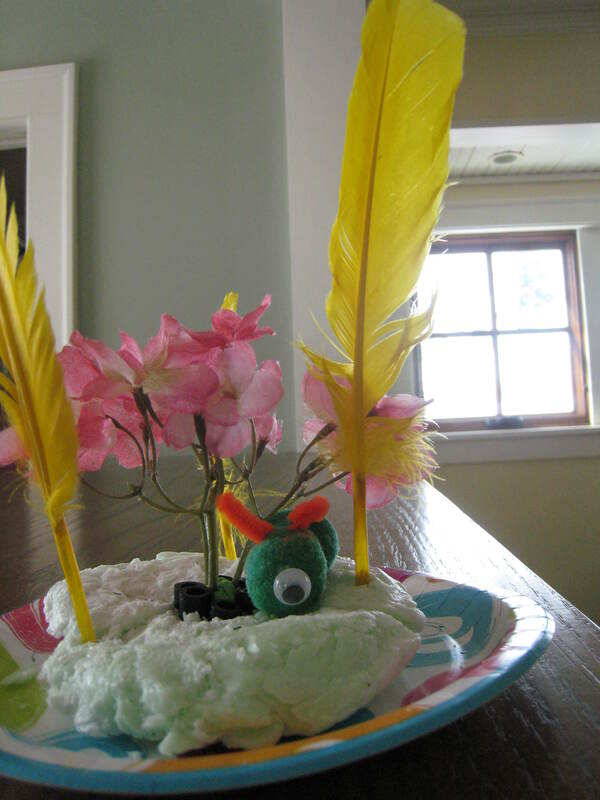 We cut out leaves and glued puffy balls on as caterpillar eggs, but my daughter’s friend used a green feather as a leaf and your child could use anything they want as an egg (crumpled up aluminum foil?) 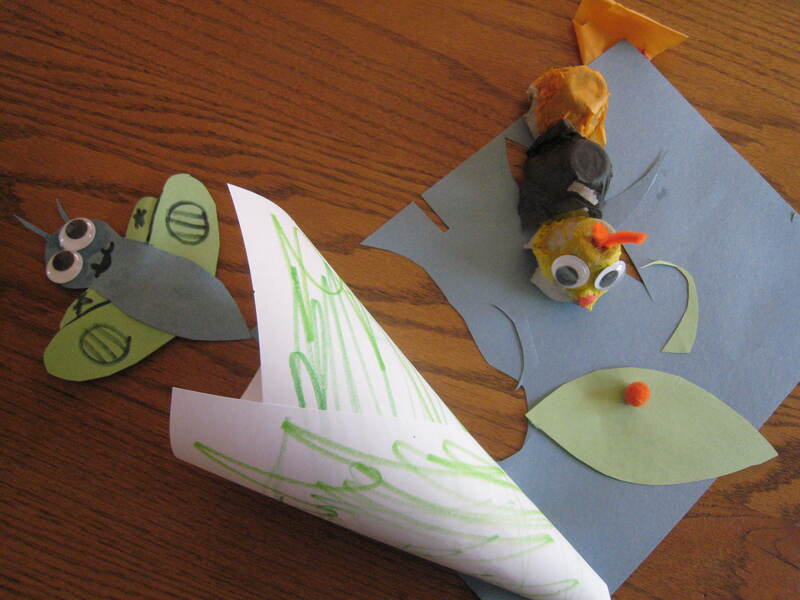 Next, the kids created caterpillars from egg cartons I helped them cut up. They used tissue paper, pipe cleaners and googly eyes, but it would work just as well to use markers if you don’t have art supplies! 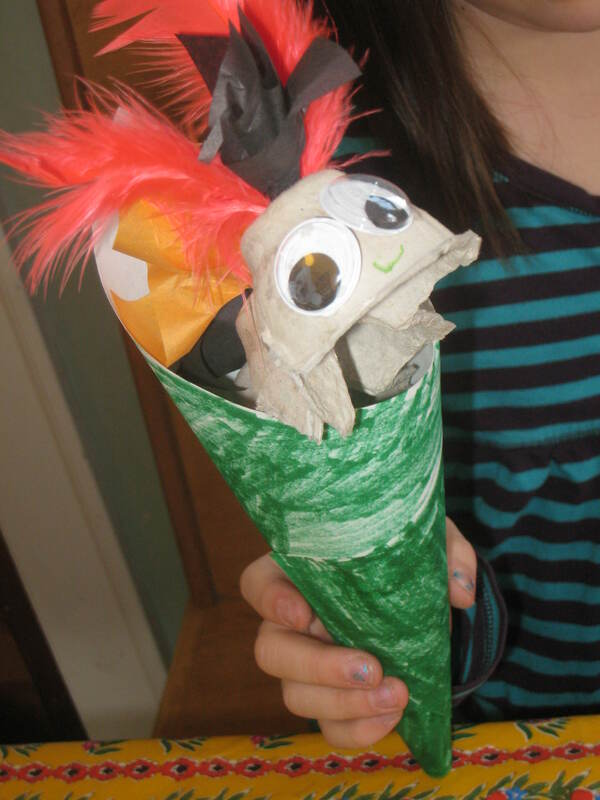 They taped paper into a cone to make a chrysalis and made butterflies from coffee filters and paper and corks. I’m not giving specific directions because this project is all about imagination. When they were finished, the kids tucked their butterflies into the cocoons, put the caterpillars in next to them, and pretended the butterflies were hatching out. They thought it was pretty cool, but making them was the best part. If you have the book “The Very Hungry Caterpillar” by Eric Carle, these would make great props so your child could act out the story as you read it! It’s also a great way to teach them about metamorphosis. Have fun! Before the days of plastic, foamy, pre-cut, pre-designed craft projects, there were the 70s, when I was a kid. 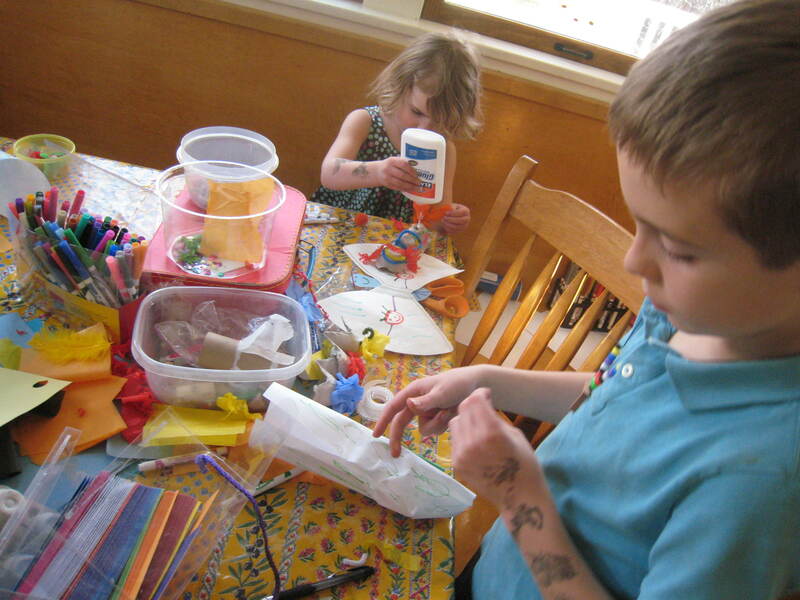 We made paper-maché piñatas, twine macramé plant-holders and did lots of art projects using objects from nature or things that we had around the house. They weren’t always beautiful, but it was lots of fun making them. I love the idea of recycling things into art, for both environmental and financial reasons. Who hasn’t walked into a craft store and spent a ridiculous amount of money on a bunch of things that will never break down in a landfill? 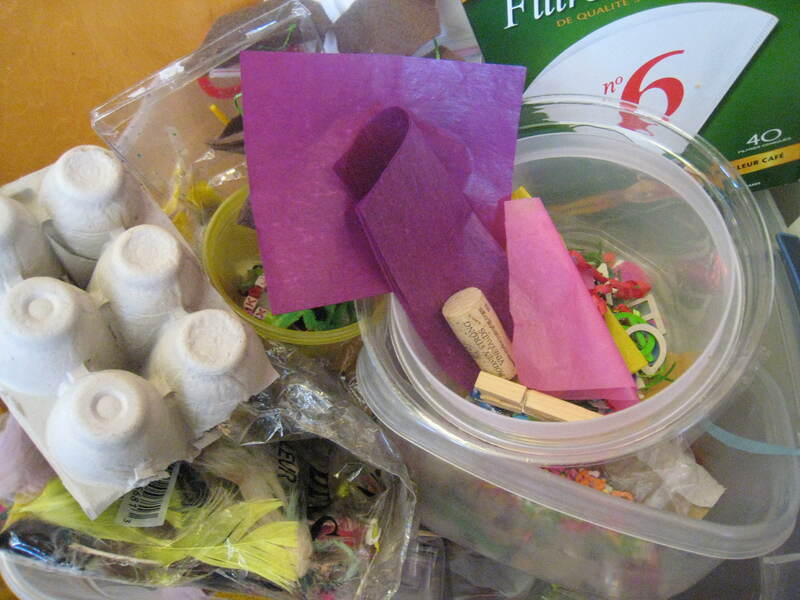 If you haven’t already, you should create a “junk box” for your child to fill with things that have potential to become great art projects. 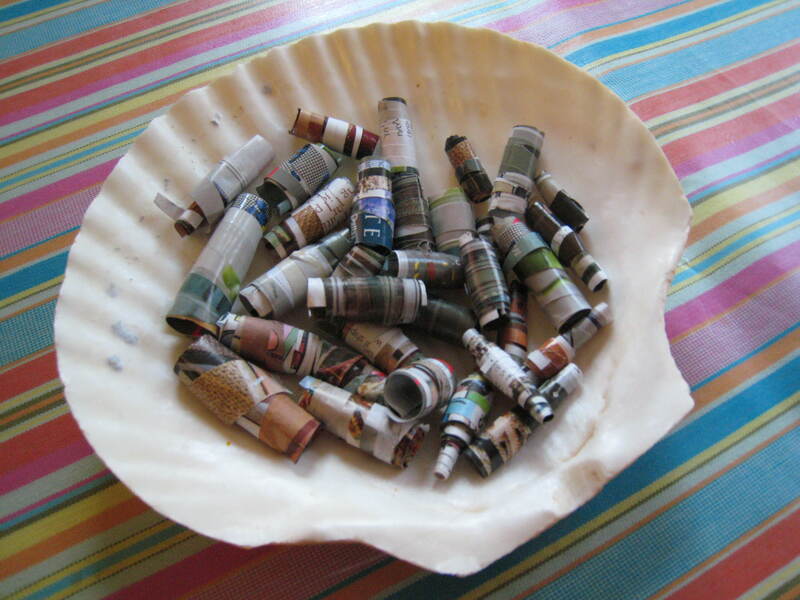 Find a container that you already have around the house and you and your child can fill it with colorful magazines, old buttons and crayons, corks, bottle caps, ribbons, Popsicle sticks, wrapping paper and cloth scraps, cardboard jewelry boxes or pretty bottles-anything that you or your child see potential in. Try to see the possibilities in the things you normally throw away. 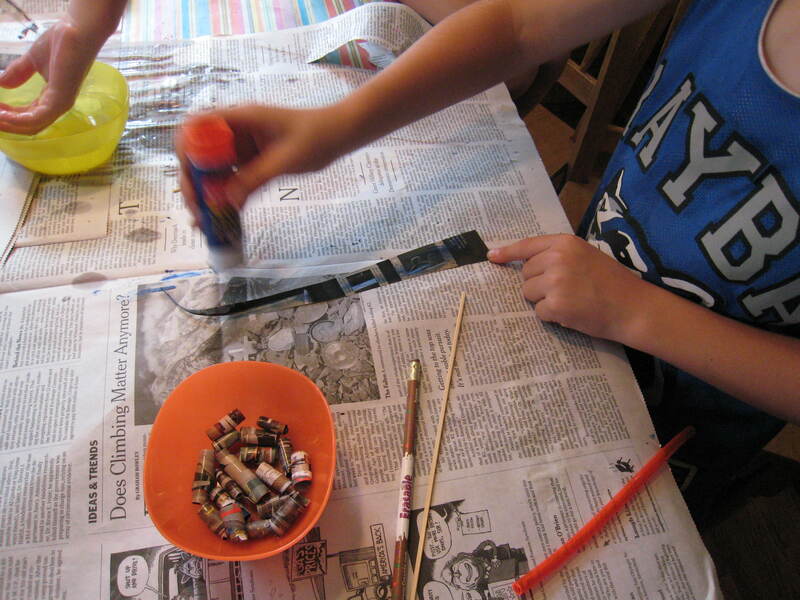 One childhood project that I remember, and re-created with my kids (4, 7 and 9years old), is making magazine beads. My older children loved it and my four year old had a great time just squeezing glue onto the newspaper we were working on. All you’ll need are scissors, cardboard (optional), magazines, glue and pencils, straws or wooden skewers. First, cut out a cardboard template in the shape of a long triangle about one inch wide at the bottom and about 8 to 11 inches long. 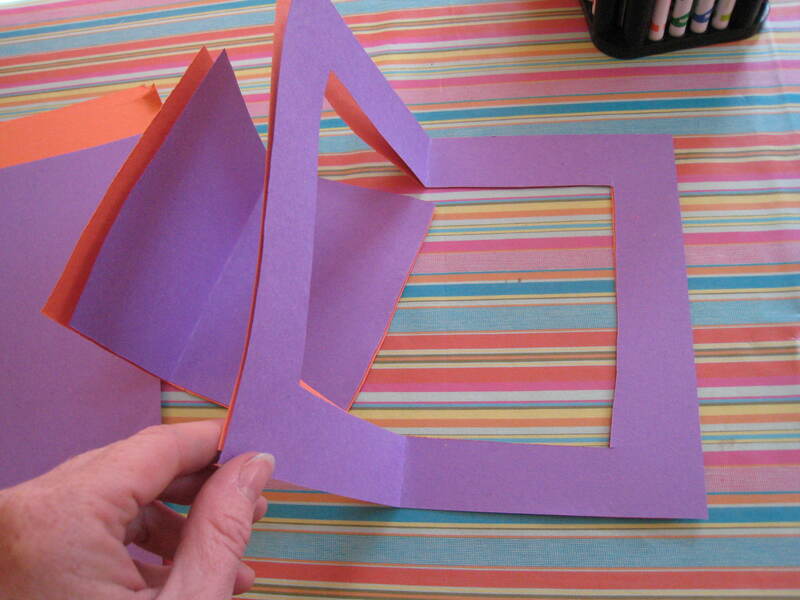 Use the template to trace triangles on colorful magazine pages or old wrapping paper. Have your child cut the triangles out, or help them do it. (You can also just guess and free-hand the triangles, which is what I did.) Use a glue stick to put glue on the back of the triangle, but try to leave the bottom inch or so of the wide base of the triangle glue-free. Then, have your child wrap the paper tightly, starting with the base, around some sort of stick (we used pens, straws, pencils and wooden skewers with the sharp ends broken off.) You may have to glue the tip of the triangle down when you’re done. Finally, just slide the “bead” off of the stick and you are done! Older children will do fine with skewers, but younger ones may be more successful with pens or pencils. Your child can use the beads to make garlands, necklaces, bracelets, or ever glue them tightly side-by-side to an old picture frame to make it new! Just remember, it’s the process that’s important, not perfection. Remind your child that imperfect things much more interesting than perfect ones! New spring projects on the way soon! Keep posted! 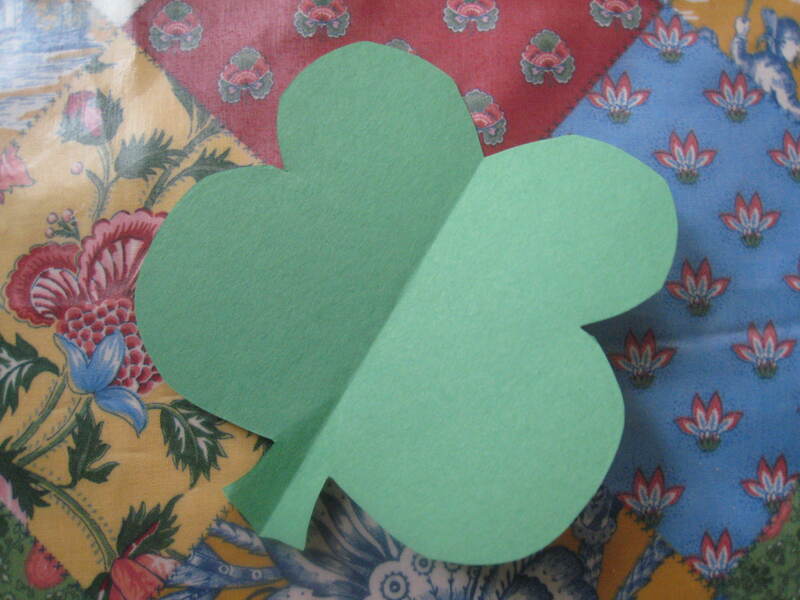 Your kids can create a lovely garland of hearts or shamrocks to adorn your living space. In the spring, we like to liven up our breakfast booth by stringing hearts or shamrocks, depending on the holiday. All you need is construction paper, scissors, string and a hole punch. It’s pretty self-explanatory. I folded the paper and drew the outline for my four year old, who loves to cut and cut and cut. My son, who is nine, could make the hearts, punch the holes and put them on the string. He also figured out how long the strings should be. We found that it is easiest to just put all of the hearts or shamrocks on the string, put the string up and then slide the hearts into position. The kitchen string (for tying meat) works well, because the construction paper won’t slide on it and the hearts stay in place, but you could probably use yarn or any other string. It’s nice to have some extra color around at this time of the year! 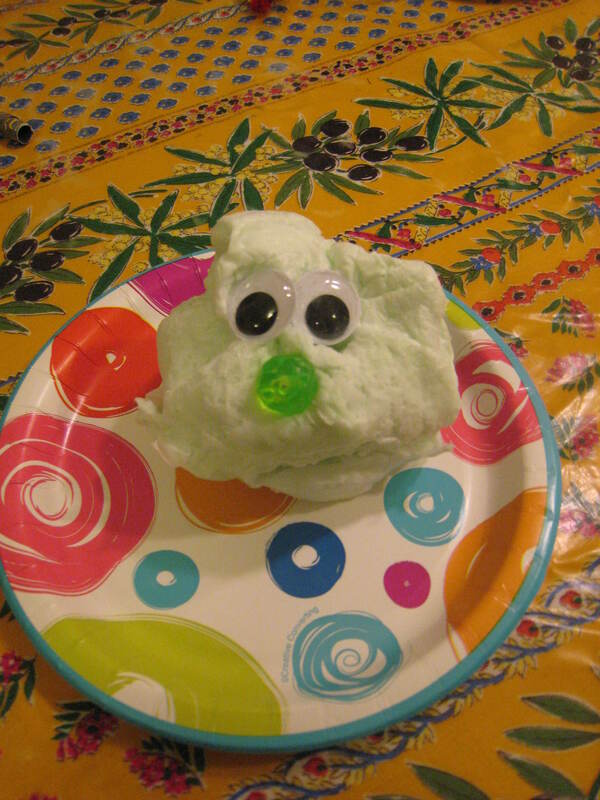 Put a bar of soap in the microwave and watch it grow into a monster shape that your child will have a great time decorating! 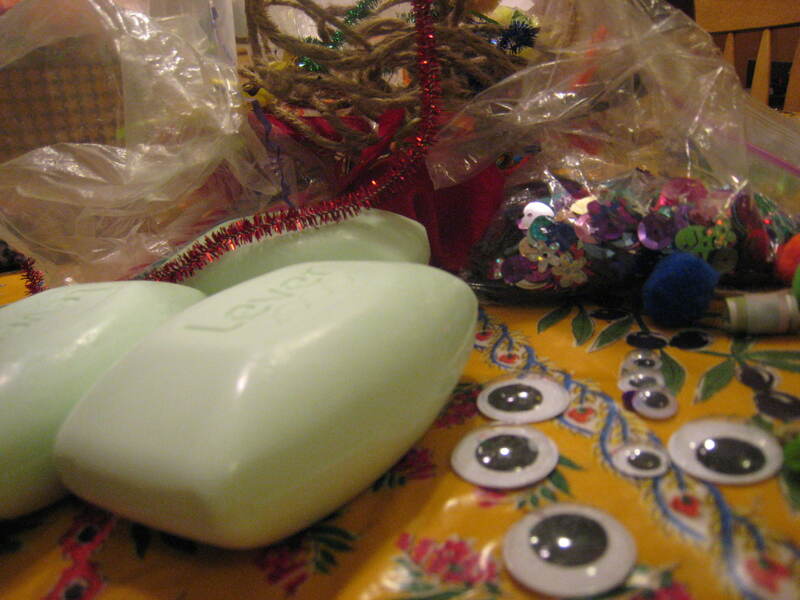 All you need is UNSCENTED soap and your craft bin (pipe cleaners, googly eyes, buttons, ribbons, toothpicks, wrapping paper, corks, etc.) 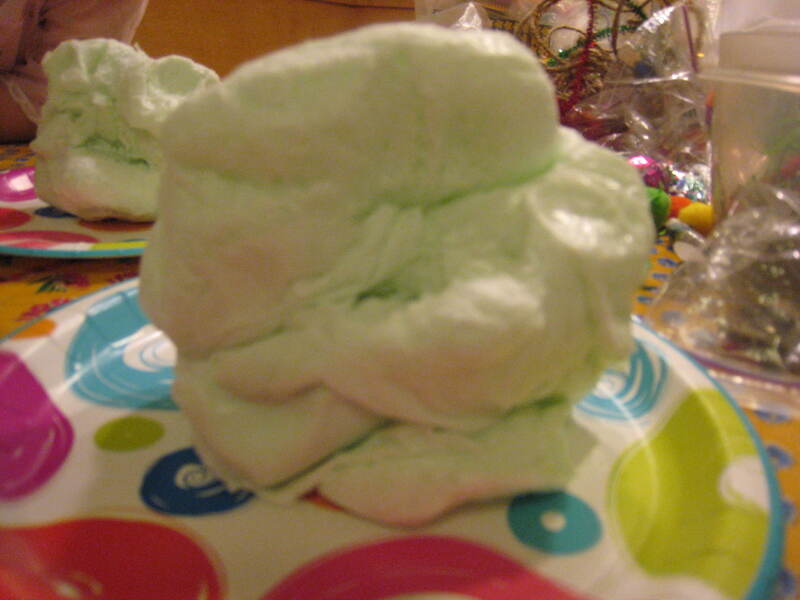 Put the soap on a plate in the microwave, set it on high for two minutes and watch it expand into a blob as it cooks. If it’s not puffy, put it in for another minute or two, keeping an eye on it. Take it out and let it cool a little so that your child doesn’t burn their fingers when they decorate it. (It is hotter under the surface.) Let them stick beads, feathers and pipe cleaner into their creature. We had trouble getting the eyes to stay on, since the soap is slick, so I’d recommend helping them with this so they don’t get too frustrated, or just using something that will stick in to the soap far enough so that it doesn’t fall out. What happens? The soap contains moisture, which evaporates when heated, forming bubbles which can’t escape. Try it with clear soap or colored soap. Don’t use scented soap like I did or your whole house will smell like a bathtub! For this project, I thought that it would be fun mix a little science and a little art. 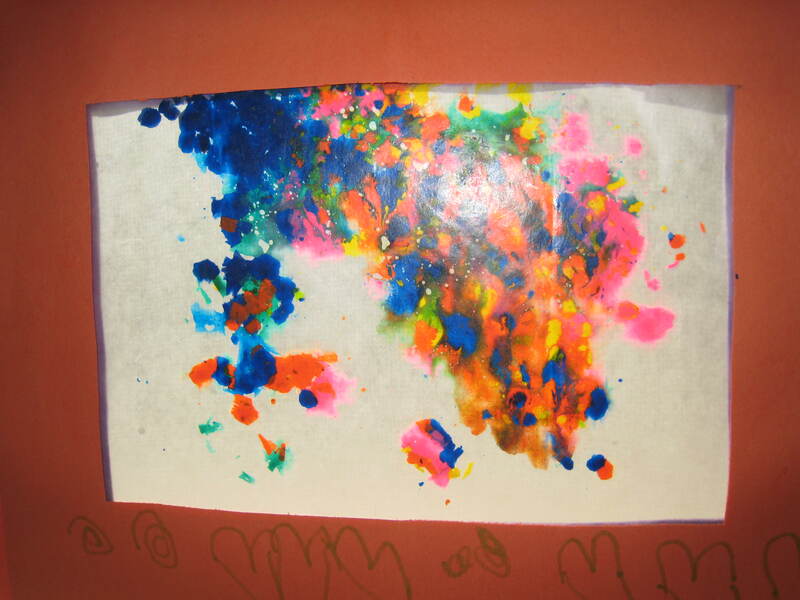 My sister told me that you could make cute Valentine’s cards using fingerprints. I’ve also heard that it’s pretty easy to lift fingerprints using scotch tape, so I thought we’d give it a try. For the valentines, you will need an ink pad, paper and markers. All you need for the science part is paper, scotch tape and a pencil. VALENTINES: For the Valentines, have your children put ink on their fingers and make fingerprints or thumbprints together in the shape of a heart. Of course, they will also want to make fish, bugs, and who knows what else? I gave my kids some ideas to get them started and they went from there! They can decorate with markers. It’s lots of fun! We got our stamp pads at Creative Kidstuff, but you can find them almost anywhere. There are few things better than a homemade Valentine! Have your kids make them for the people they love! Last year, my kids made them for everyone in their class. 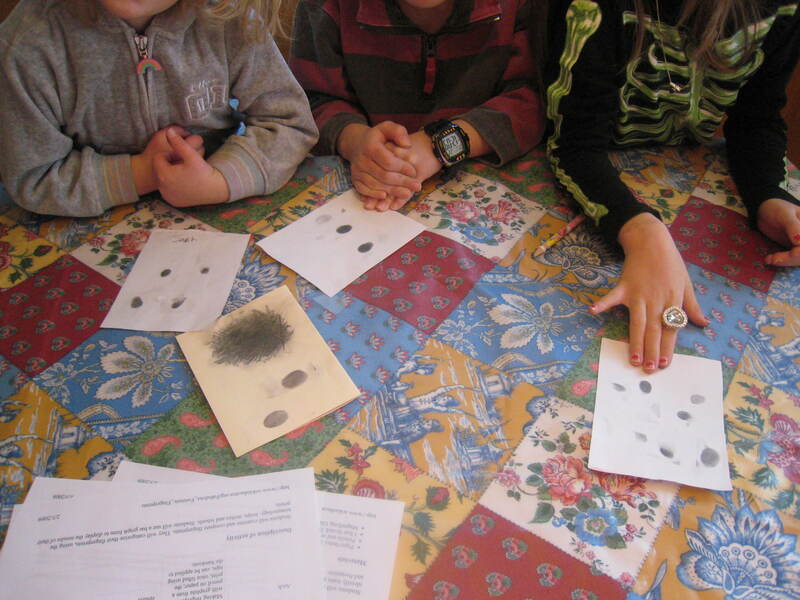 SCIENCE: On www.wikieducator.org/Fabulous_Forensic_Fingerprints, I found a fingerprint-lifting technique that works well, even for very young children. Simply take a pencil and scribble on a piece of paper until a small area is covered with the graphite from the pencil lead. Have your child rub his or her finger around in the graphite until it is covered with gray. Then, have your child carefully place their finger on the sticky side of a piece of scotch tape. Have them lift their finger off of the tape. A clear fingerprint should be visible. Place the tape face-down on another piece of paper. Your child can then inspect the fingerprint under a magnifying glass, or just with their naked eye. If you go to the wiki website I mentioned, your child can decipher whether they think their fingerprint is a whorl, a loop, or an arch. It would be fun to have them trace their hand, fingerprint each finger and thumb, and tape their fingerprints to the correlating finger. This would be a great addition to their science notebooks! I’ve found that their notebooks are great keepsakes of their drawings and observations at different ages. The kids had a lot of fun with this project and could do it unassisted once I showed them what to do. I adore tie-dye. Maybe it’s the time I spent in San Francisco and Berkeley as a kid, but I think it’s really just the rainbow of bright colors and swirled patterns that makes me smile every time I see it. 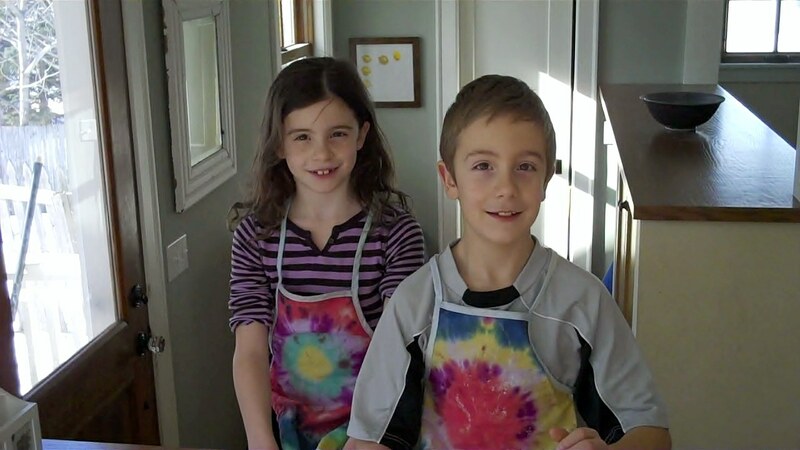 Last week, my kids and I had a great time making our own tie-dye shirts, aprons and pillowcases. This is a project that required a trip to the craft store, but it was worth the time and $20 I spent on the kit. We bought a basic kit with five colors: red, yellow, green, blue and purple. It came with squirt bottles containing the powdered colors, rubber bands and rubber gloves. The dye does stain (obviously), so no matter what kit you buy, be sure that you have rubber gloves and cover your workspace with plastic. We taped together plastic bags to cover our kitchen table. 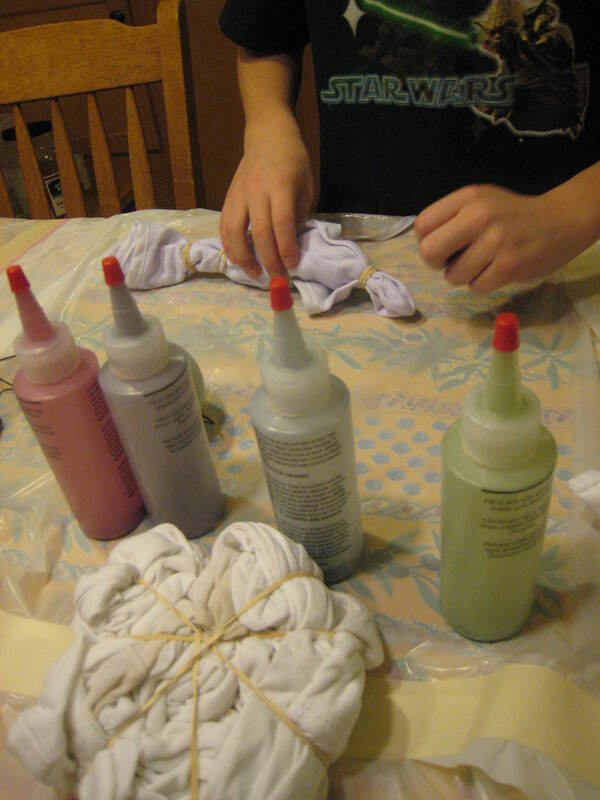 You will also need cotton items to tie-dye. We dyed aprons, a tee-shirt and a pillow case. 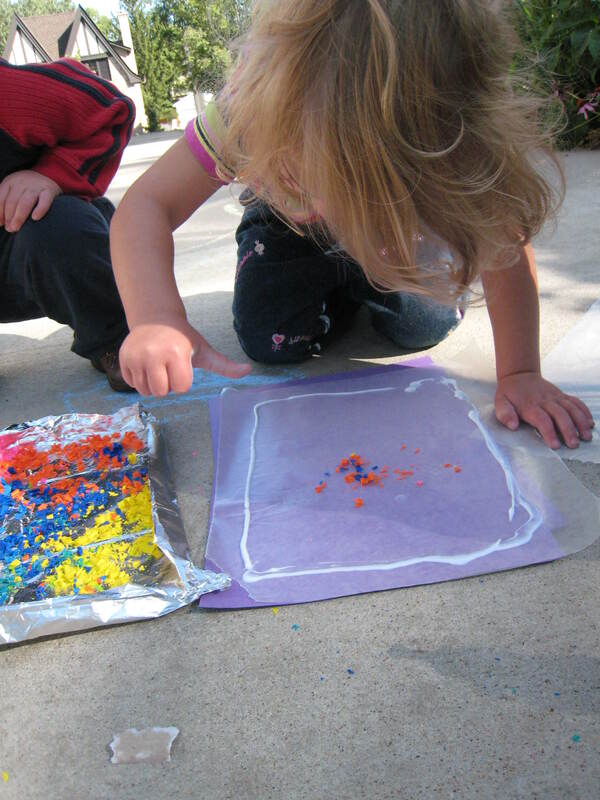 The instructions had us wash them before starting the project so that the fabric would be damp. We did both swirl and target patterns. For the swirl patterns, we just layed the tee-shirt flat, grabbed the fabric in the middle and twisted until the entire shirt was coiled up. Then, we criss-crossed rubber bands around the shirt, dividing it into 8 sections, like a pie. For a target pattern, grab the fabric where you want the center of the bullseye and let the rest hang down. 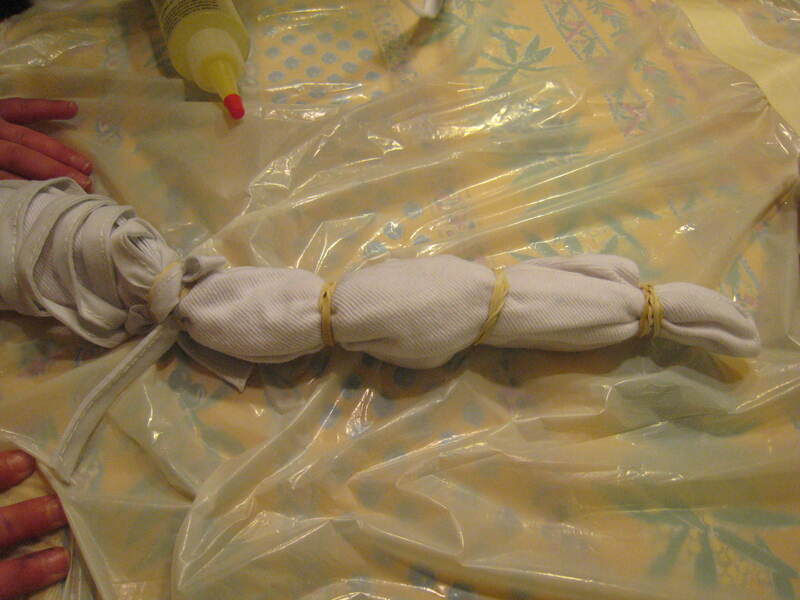 Then put rubber bands every three or four inches down the length of the fabric. I helped the kids twist the rubber bands around the fabric 4 or 5 times to get them as tight as possible. There is an ideal way to do things, and then there is the way you actually end up doing them. I’ve been doing this project with my kids for years. Usually I do it right, mixing up frosting and gluing the little houses together ahead of time so that the kids can decorate them later, when they’re dry and sturdy. This year, friends came over and I didn’t have any frosting mixed up, so I let the kids put the houses together with spray-can frosting and decorate them an hour or so later. 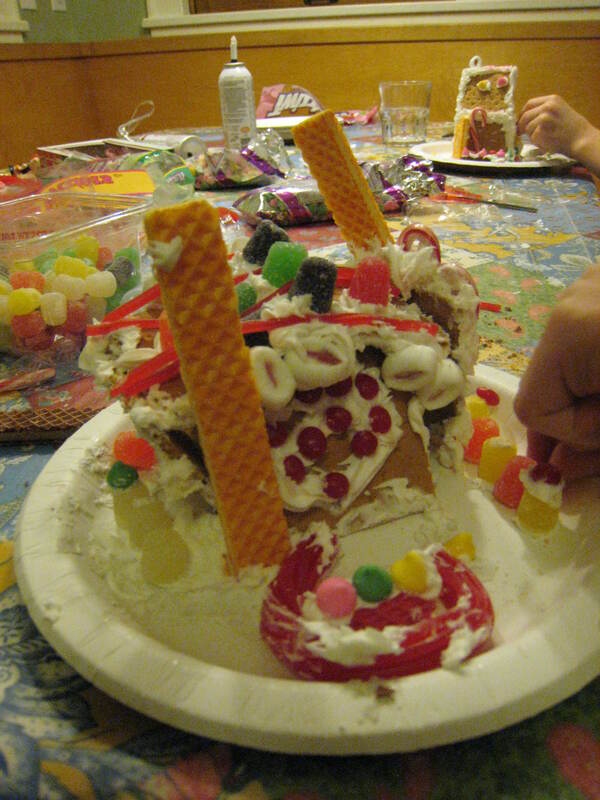 There was lots of shoddy construction and many walls collapsed and had to be pushed back up and reinforced with candy canes, but it didn’t really matter. The kids loved it as much as ever. 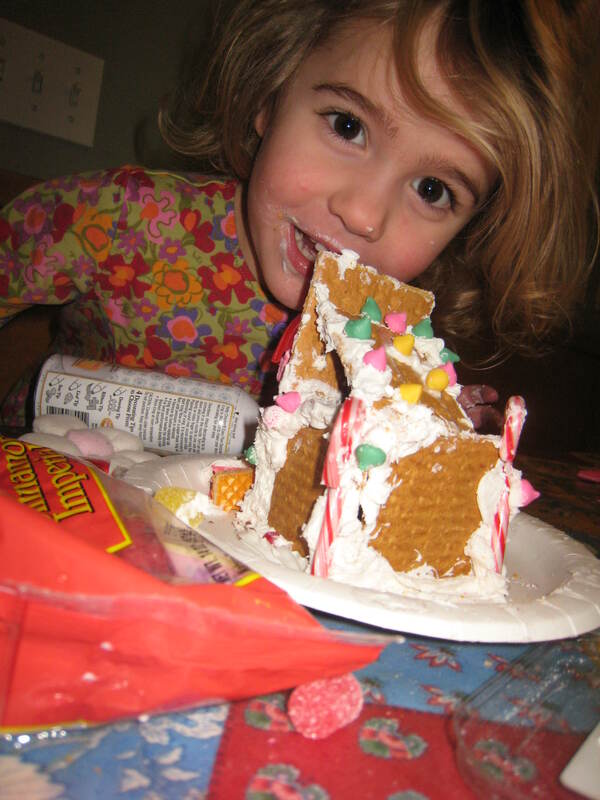 To make graham cracker cottages, you will need graham crackers, paper plates, spray-on frosting in cans (the kind that comes with plastic decorating tips) and lots of candy to decorate with. Making your own frosting is simple too. I’ll include the recipes at the end of this post! For the hard frosting used to glue the crackers together, you’ll need powdered sugar, egg whites (I’d recommend pasteurized eggs), and cream of tartar. For the softer decorating frosting, you’ll need powdered sugar, butter, and a little milk. If you make your own frosting, don’t forget to have a pastry tube and decorating tips for applying the frosting to the graham crackers! 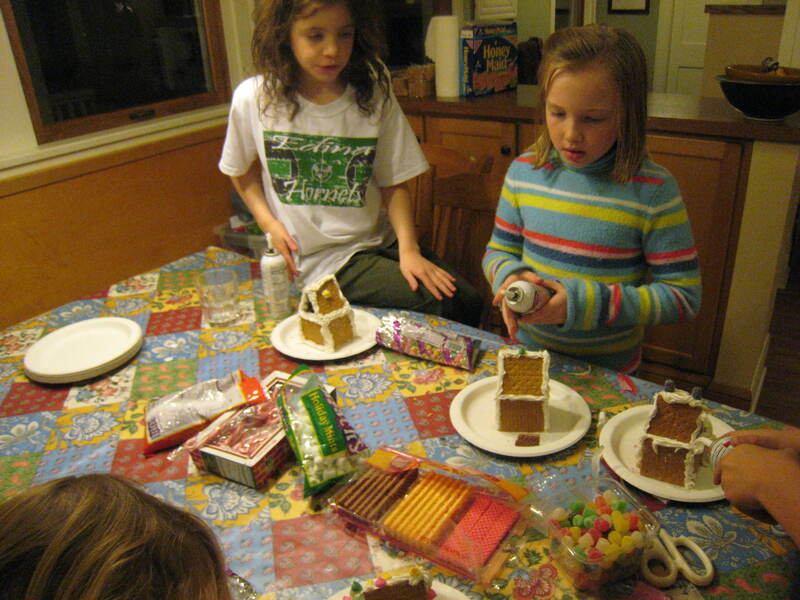 Building the cottages: First, break the graham crackers into squares. Put a dab of frosting (spray-can or egg-white frosting) on a paper plate and stick a square to the frosting. Then, pipe frosting around the square (on the plate) and put up four square walls by sort of leaning the crackers together. Pipe frosting between the cracks to hold the walls together. Now, pipe frosting around the tops of the walls and lean two graham cracker squares together to form a roof for your cottage. Pipe more frosting at the top of the roof and onto any exposed graham cracker edges to make it look pretty. If possible, allow the cottage(s) to dry until the frosting is hard. 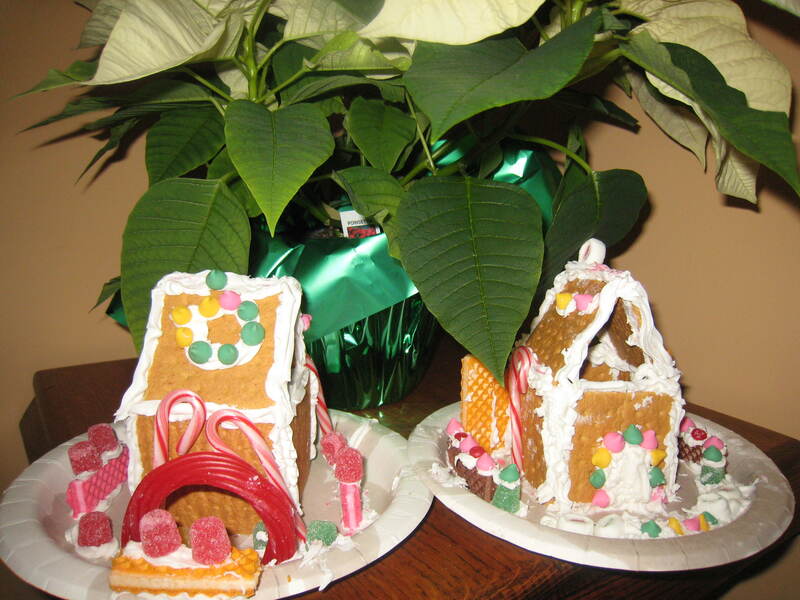 Decorating the cottages: Have your child pipe spray-can or soft frosting onto the cottage and stick pieces of candy and cookies onto the frosting to decorate the them. Younger children may need help applying the frosting, but they like to do it themselves, so let them try, even if it doesn’t look perfect! I always make a cottage that I can decorate too, so I don’t try to take over my kids’ projects. After all, why should kids have all the fun? Royal Icing (for gluing cottage together): To one pound powdered sugar, add three egg whites and 1/2 tsp. cream of tartar. Beat until firm. 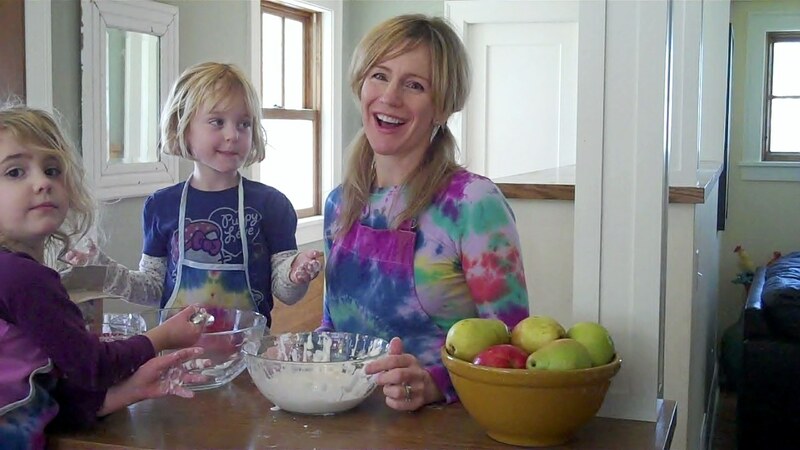 (The more you stir this icing, the firmer it will get.) Cover with a moist cloth until use. Butter Icing (for decorating): Cream 4 Tbs. butter until very soft. Add two cups powdered sugar and mix thoroughly. Add a drop or two of milk at a time if the mixture is too stiff to pipe through your decorating tube. You want to make it soft enough for your kids to push out easily, but not so runny that it won’t hold its shape. Don’t worry, you’ll figure it out and it doesn’t have to be perfect!